We are very excited that you have subscribed to Lip Monthly. 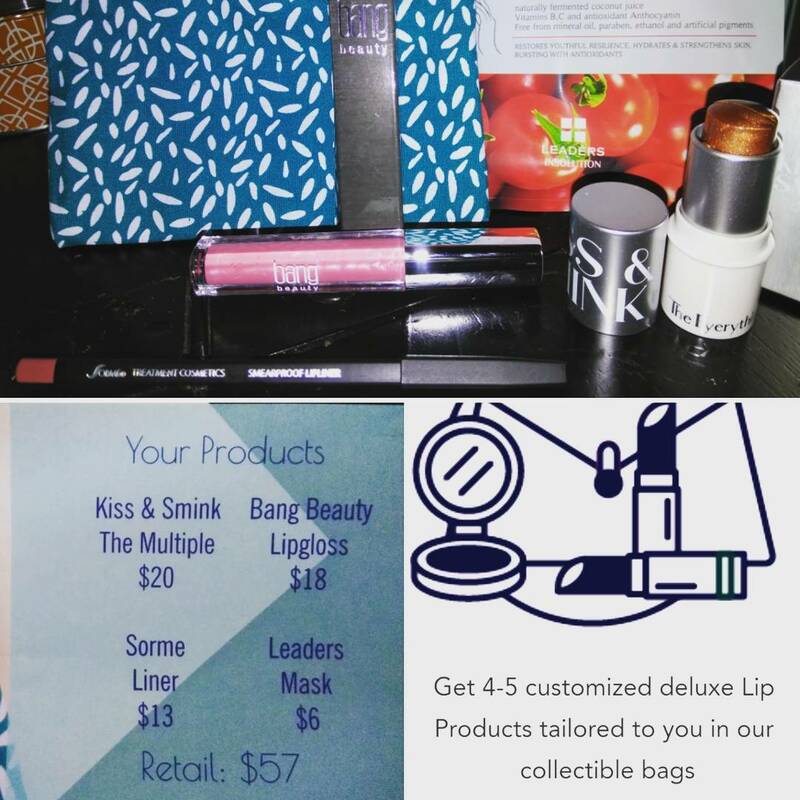 Your first Lip Monthly package will be shipped within the first 10 business days of September. Ugh a month away.. Ok I can do this, it is only a month away... So I waited... and waited ... and waited.... NO bag at the end of September so I stopped payment on the next months subscription and received a notice my payment was not successful to which I replied that I still had not received the Sept bag I had paid for in August so I was not going to approve another payment at this time. I received a shipment email and my September bag on October 6th!! Ok so no one is perfect!! Lets get into this bag and see what my patience is being rewarded with!! a gloss from Bang! 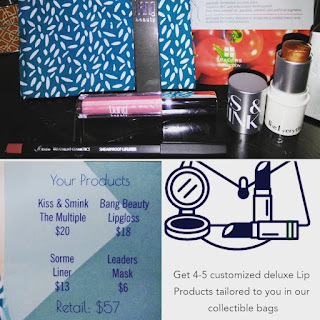 I like darker colors but that is not one of the customized options for this month and I can live with that, a Kiss and Smink stick that is versatile and can be used on cheeks, lips, contour... etc., a Sorme liner that I will try one day but I don't line them that much so it may take a while... and last and least.... A face mask??? Wait the ad says 4-5 customized deluxe LIP products..... Only one product a month is customized and one isn't even a lip product? Hmmm, I am not exactly thrilled with the way we have started out but I am willing to give it another go. I renewed my payment and it was processed at that time. I receive the email to customize my product for the month and log in and the first thing I see is a note saying my payment hasn't been made. I will address that with the company after, second thing I see is the customization, it is an eye shadow?? Ok this is a little annoying not only is at least one of the items for October going to be a non lip item but it is the one I can customize? I am really not feeling this whole thing now and starting to have doubts. So I email the company about the payment. I let them know that on top of not getting my first box till a month later and only after I had emailed them that I was disappointed in the fact that they were not all lip products. I received an email addressing not getting my Oct box yet... that wasn't the issue at all, and saying they do a monthly box mix up which is why I received the mask. Ok so your ad states that I will receive 4-5 lip products but I only received four products total and one wasn't lip? I included this is my follow up email and was told I should have read the FAQ's. It is now October 21, I still have not received my October bag, and customer service is pretty much not that great I have a feeling I will be cancelling my subscription after this! Where can you get it? Lipmonthly.com well I guess this is where you can order it as for getting it haha you might??? Is it worth it? The products are good products I just didn't like the fact it wasn't what they advertised, shipping is not dependable, and customer service is horrible!